New Application Subsections on Our Website! As the number of software solution options increase, finding an option that works on your machine can be a time consuming task. To answer this concern, we have added a new subsection to each machine listing called “Business Applications,” which will list the software that is available for that machine. In addition, we’ve created another short cut if you want more information on a piece of software. Just click on the Business Application name and a new page will open up with full details on the software. When you’re done, just close the page and your original page will still be on the screen so you can continue where you started. Hope you enjoy this new option. If you have any suggestions on how to make it easier for you find what you need, just email us at solutions@brothersii.com and we’ll do our best to make it happen. 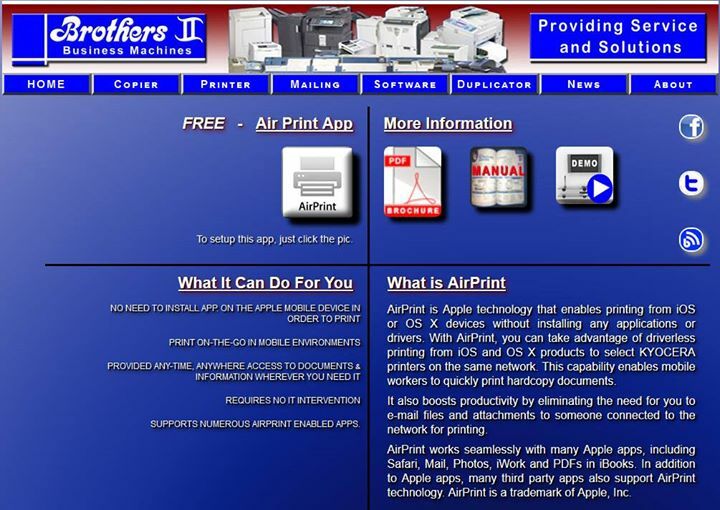 AirPrint is Apple’s IOS solution for printing wireless from your mobile device…and it’s free! Kyocera and Copystar continue to expand their software solutions and application options on a regular basis. Reviewing them all can be a daunting task. For that reason, Brothers II has begun to create an easier way for you to review and find the application that will benefit you the most. On our web page (under software, copiers,) you will find many of the applications available to you to make your life a lot easier and commercially more productive. Reviewing all these apps is a breeze; simply choose a category and mouse over the application icon and a brief description of the benefits appears. Need more detail? Just click on the icon and you will be directed to that application’s page. There you will find a very easy format of what the application is, it’s benefits, a brochure and how you can get it.